Find technical informations, list of planned stations and maps here. As important as the railway in Laos is the connection from the Lao border to Yuxi in Yunnan, from where an existing railway line leads to Kunming. China is building the 503.9 km long Yuxi-Mohan railway 玉磨铁路, also called Yumo Railway, with very high speed through rugged mountains. It counts 133 bridges and 91 main tunnels. Yumo railway will be electrified and have double-track from Yuxi to Jinghong and single-track from Jinghong to Mohan. Get an overview about the progress and find Yuyi-Mohan Railway 玉磨铁路 Google Map. Chinese Railway Project in Laos Leaves Farmers in the Lurch: The railway has displaced more than 4,400 families from their land, many of these families have still not been compensated, reports rfa.org. Rattanamany Khounnivong, vice minister at the Lao Ministry of Public Works and Transport, told RFA late last year that those who lost houses and did not have places to live would get paid first, while those who lost farmland might get paid later. 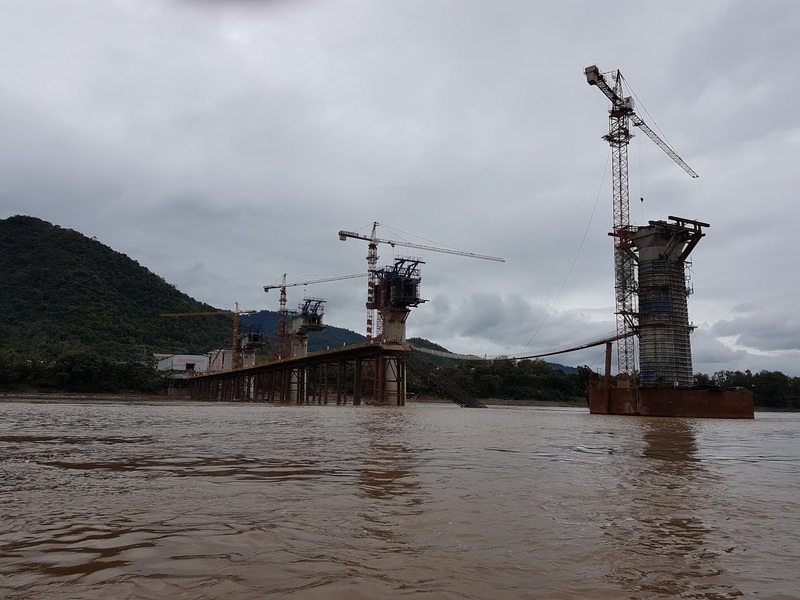 According to ABC Laos News’ Facebook page, Khounnivong said at a railway project committee meeting in November last year that of the $300 million that the government must pay out in compensation for losses related to the project, only $156 million has been paid. According to rfa.org the government must therefore borrow money from China to pay the rest this year. Lao Villagers Reject Plans For China-Invested SEZ in Vang Vieng: The project, managed by the Chinese firm Lao-Vang Vieng New Area Development Company, will affect 22 villages lying to the west of the Xong river, reports rfa.org. 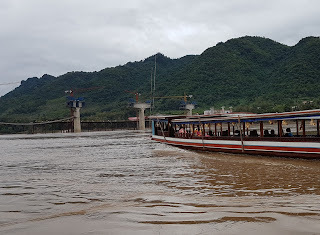 Signed by the Lao-Vang Vieng Company last year in a memorandum of understanding (MOU) with Laos, the project will run in three phases over 15 years at a cost of U.S. $5.5 billion, and is expected to create 50,000 jobs, according to Lao media sources. 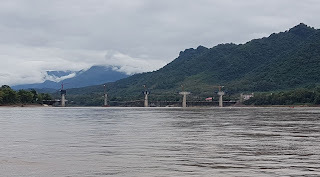 "Defaming Laos-China Railway is Ignoring Lao People’s Future": Chinese writer Zeng Ren argues on Chiang Rai Times, that the Laos-China railway "will become an important pillar of Laos’ economic growth". He gives the following data about expropriation of land: "About 3,000 hectares of land will be permanently taken over and 800 hectares of land will be temporarily used. Some 4,411 households will be affected due to the construction of the railway". He goes on: "Lao government is now seeking the opinion of relevant parties on the compensation standard. According to the requirements of railway projects, the compensation for land in different sections differs and is mainly based on whether the land is connected to national highways, provincial highways, village roads, or have no road access. Villagers affected by the railway will also be paid for their houses and apartments, as well as small buildings such as kitchens, sundries, garages, shops and animal houses. In addition, the developers of the railway will compensate people for crops and fruit trees that must be uprooted due to the railway construction. (...) The government’s compensation standard is 320,000 kip – 3.5 million kip per square metre (about US$37-US$410 per square metre). Plus other compensation for farmland, homesteads, young crops and so on, the amount of compensation will be considerable and equal to the annual income of local people." How Asia Fell Out of Love With China’s Belt and Road Initiative: "Countries are discovering that the promise of Xi Jinping’s signature infrastructure program is too good to be true", writes bloomberg.com. 1,158-m-long Nateuy No 1 tunnel on the China-Laos Railway in Luang Namtha has been drilled through by China Railway No.5 Engineering Group (CREC 5). Huang Zongwen, a senior official with the China Railway No. 5 Engineering Group (CREC 5), told Xinhua the construction of the Nateuy No. 1 Tunnel, with 1158 meters, was started on June 3, 2017. "That the tunnel passes soft rocks all the way in the mountain, brought some difficulties in construction and especially, affected the digging pace," Huang said. See pictures. 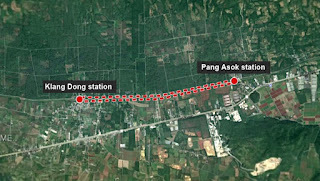 Thailands Deputy Prime Minister Somkid Jatusripitak complained Monday that the development of the high-speed Thai-Chinese railway from Bangkok to Nong Khai is lagging behind schedule, as Bangkok Post reports. The route is divided into two major phases. The first is Bangkok-Nakhon Ratchasima, which is 253km in length and set to cost 179 billion baht. The second phase runs from Nakhon Ratchasima to Nong Khai province. 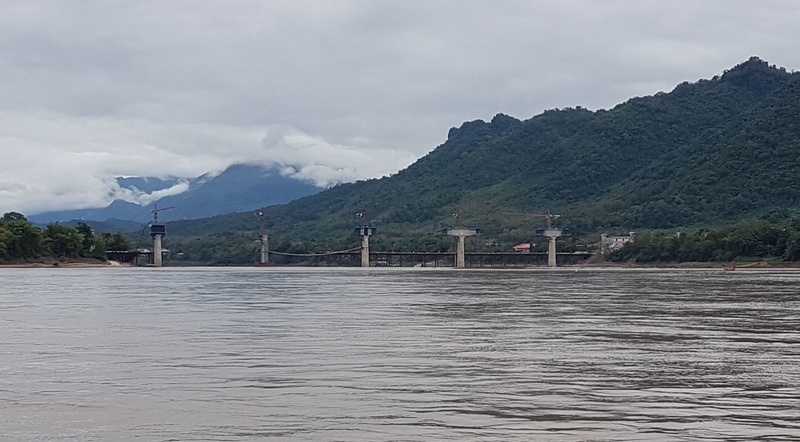 The Chinese contractor told Xinhua the concrete casting for the first block of the Luang Prabang cross-Mekong River bridge' continuous beam along the China-Laos Railway was completed on September 17. Yan Haiyong, CPC party secretary of the China Railway No 8 Engineering Group (CREC-8)'s railway project department, who is in charge of the construction of the two bridges across the Mekong along the China-Laos Railway, said that the Luang Prabang railway bridge with a total length of 1458.9 meters, is a key project of the China-Laos Railway. According to Yan, the bridge's continuous beam design has high technical standards and is difficult to construct with pier-side bracket. The first block of the continuous beam has a length of 12 meters and consumes a concrete volume of 266 cubic meters. (Reported by steelguru.com. 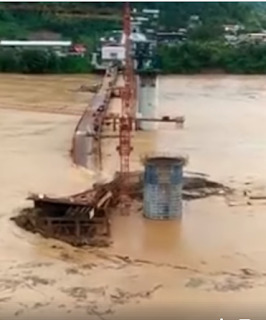 After days of heavy Monsoon rains, that caused floods in Luang Prabang province, a bridge across Mekong river has collapsed into the river. It served to construct the new railwy bridge across the Mekong near Luang Prabang. Picture from this video of the collapse. The Chinese-built railway through Laos is worth half of that little nation’s GDP, writes washingtonpost.com. In a report by two researchers from Harvard’s Kennedy School, former Australian foreign minister Gareth Evans is quoted as saying Laos and Cambodia, each of which has borrowed more than $5 billion, are now “wholly owned subsidiaries of China.” Meanwhile Malaysias new Prime Minister Mahathir has cancelled two multi-billio dollar Chinese projetcs because Malaysia can’t repay its debts. “We do not want a situation where there is a new version of colonialism,” Malaysia’s leader told Chinese Premier Li Keqiang. One of the projects, dubbed the East Coast Rail Link, would have connected the South China Sea with strategic shipping routes in Malaysia’s west, providing an essential trade link. The other was a natural gas pipeline in Sabah, a Malaysian state on the island of Borneo. In Phu Din Daeng, a village of 200 people about eight kilometers outside of Vang Vieng town, people have been told they should leave their homes to make way for the Laos-China railway. The people in Phu Din Daeng are living next to a giant construction site, near the planned Vang Vieng Railway Station. Until now some 53 tunnels have been bored through mountains at a combined length of 37,314 meters, while 47 of the 167 bridges to be built for the line are under construction, reports chiangraitimes.com. Laos’ cash commitment is US$720 million, of which US$250 million will come from the national budget over the next five years and the remaining US$470 million borrowed from the Export Import Bank of China at a 2.3% interest with a 35-year maturity after a five-year grace period, reports chiangraitimes.com. With a project cost of nearly one-third of the country's copy6-billion GDP, there are concerns that the debt burden on Laos will outweigh the benefits. Public debt reached 68% of GDP in 2016 (it is less than 50% in Thailand), raising the debt distress level from "moderate" to "high" in the recent World Bank/IMF Debt Sustainability Analysis, as Bangkok Post reported. The Ganlanba Bridge(橄榄坝特大桥) is 3.5 km long and has 108 supporting columns(桥墩). It has been constructed on the China side of the railway in Jinghong city, Yunnan province. 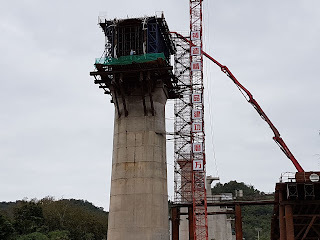 The last(最后的) supporting column of the bridge has been installed(安装), reports chinaplus.cri.cn. Read also: Chinese Tourist ‘Invasion’ Feared As High-Speed Laos-China Railway Will boost visitor numbers dramatically. In Luang Prabang Chinese low-cost retail chain Miniso opened a shop in June on Sisavangvong Road. In expectation of more regional visitors, many town-centre Luang Prabang residents have sold or rented out their properties to Chinese, South Korean or Vietnamese investors. 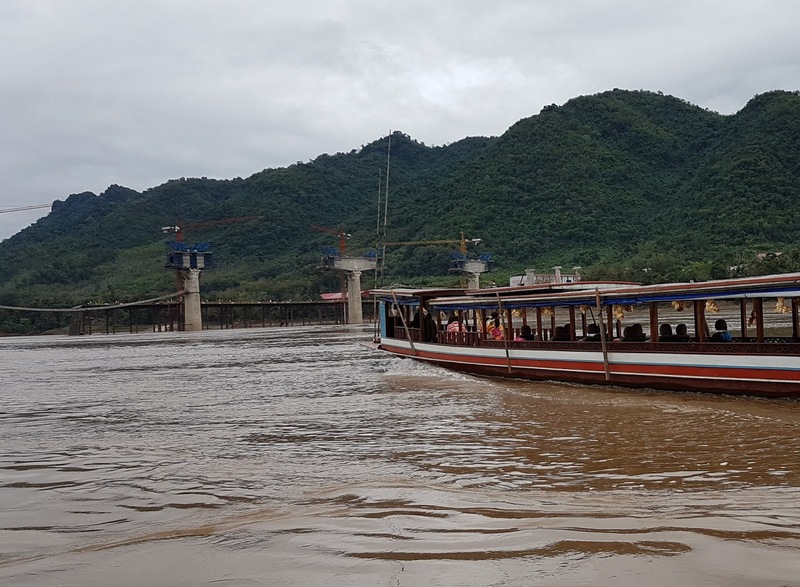 The Mekong Sunset Guest House, for example, previously operated by a Lao national, is now run by a Chinese family from Guangxi province, reports South China Morning Post. Recently, the pier No. 214 of Nanke River Bridge 楠科内河特大桥 in Laos was successfully poured. This is the longest bridge of the railway section built by the China Railway Second Bureau. Chinas railway project in Laos is "set to be completed in 2021", reports Global Times, but the network reprots difficulties as well. Huang Hong, head of China-Laos railway commanding department under China Railway Group Ltd, says, that at mid-October "we've completed 14,925 meters in the channel excavation work", while the total length of the construction tender is 244.5 kilometers, including 45 tunnels and 99 bridges. Xu Liping, an expert with the National Institute of International Strategy at the Chinese Academy of Social Sciences, underlines that the project is one between two nations, and so far not an intercontinental project extended to Thailand. But the project only makes full sense, if trains from China can go through to Thailand and down to Singapore. And the China-Laos rail project faces some difficulties. For example, funds are not always allocated on time, and Laos lacks some of the needed construction materials like cement, Huang Hong said. Zhao Xiang, director general of the Laos-China Railway Company, said according to Xinhuanet that in less than six months, site preparation has been completed for the construction of four stations; foundation construction of nine bridge piles have finished; 86 holes for construction of 46 tunnels have been prepared, of which 15 are key tunnels. More than 4,400 Lao families are being forced to relocate to make way for the Lao-Chinese high-speed railway, reports rfa.org, by citing Rattanamany Khounnivong, deputy minister at the Lao Ministry of Public Works and Transport and one of the heads of the construction unit. The ministry is working with the provincial task force committees to finalize compensation schemes for those who are forced to relocate, Rattanamany said. Workers have been blasting tunnels in mountains, building bridges and roads, and clearing land for stations and substations along the planned rail line in the three northern provinces of Luang Namtha, Oudomxay, and Luang Prabang since construction on the railway got under way late last December. In Thailand construction work has been delayed for the initial 3.5-kilometre stretch of the Thai-Chinese high-speed railway in Nakhon Ratchasima, Transport Minister Arkhom Termpittayapaisith said. The project's environmental impact assessment (EIA) report is still pending approval according to Bangkok Post. China's mammoth project to construct a railway from southwest China's Yunnan Province through Laos to its capital Vientiane is advancing now. Hundreds of trucks carrying machinery and equipment for construction have entered Laos, Vientiane Times reported. Preparations are now underway to start the boring of tunnels. The 417-km railway will have 75 tunnels with a combined length of 197.83 km and work is expected to begin before the upcoming rainy season, Deputy Minister of Public Works and Transport and Chairman of the Laos-China Railway Project Management Committee, Mr Lattanamany Khounnivong, told Vientiane Times. Officials in charge have negotiated with villagers whose land is needed for the railway and have handed over their land to Chinese contractors. Six Chinese contractors will carry out construction of the USD 5.8 billion railway, with completion slated for 2021. China Railway No 2 Group Co Ltd is responsible for the construction of Muang Phonhong section, as we learn by chinadaily. According to this source construction of the project is scheduled for five years with investment of some 40 billion Chinese yuan (USD 5.8 billion), 70 percent of which comes from Chinese investment and the rest 30 percent from Lao side. China Railway Group (CRG) has signed a RMB 8.1 billion (US$ 1.2 billion) agreement to build the first three sections of the Boten-Vientiane Railway Project according to khl.com. "The Nation" shows a picture of the Boten End of one tunnel, where boring has begun. Also in the province of Luang Prabang preparations are underway by China Railway No.8 Engineering Group, see pictures showing a tunnel near Luang Prabang. Construction has begun, but questions remain. Discussions concerning loans and interest rates are ongoing between Laos and China, says Agatha Kratz, an associate policy fellow with the European Council on Foreign Relations, according to asiasentinel.com. Another skeptic is Ruth Banomyong, the director of the Center for Logistics Research at Thailand’s Thammasat University. Asiasentinal quotes her: “The challenge will come when Laos will have to repay,” she warned. “Will they have sufficient revenue generated to repay? This is doubtful as the financial feasibility study done by the Chinese does not have realistic assumptions.” According to a paper by Lao government Laos gets a Chinese loan of 480 Million US Dollars at 2.3 percebt rate per year to pay for 50 Million US Dollars, while Laos has to borrow the rest at the rate of 3 percent. See the paper in Lao: ເອກະສານໂຄສະນາເຜີຍແຜ່ນຳພາແນວຄິດກ່ຽວກັບໂຄງການກໍ່ສ້າງທາງລົດໄຟລາວ-ຈີນ. See map of the Boten-Vientiane-Railway-Line and read more technical details. China's mammoth project to construct a high-speed railway from southwest China’s Yunnan Province through Laos to its capital Vientiane is more and more in delay: The government of Laos tries to get a better loan interest rate from China, as Bangkok Post reports. Beijing has offered a US$500-million loan with a 3% interest rate for 20 years according to Vientiane Times. The estimated costs now: US$6.8 billion. The Lao and Chinese governments should be responsible for 40 percent of the total cost, while state enterprises of the two countries should jointly be responsible for sourcing the remaining 60 percent. Delays are not new for this project. "Beijing is believed to be waiting for the Thai parliament to approve a planned £41 billion infrastructure upgrade, which will include a high-speed rail line from the Laos border to Bangkok, before signing off on the loan", reported telegraph.co.uk in January 2014. The railway risks to create a financial desaster for Laos: Laos plans to borrow £4.5 billion from Beijing to pay for its section of the railway. This is almost 90 per cent of Laos’s annual GDP of £5.2 billion. The loan will make Laos the world’s fourth most-indebted nation after Japan, Zimbabwe and Greece - "trouble for a poor country", wrote The Economist. Read also: China's commercial 'takeover' of Laos by Nikkei Asian Review. But right now the political crisis in Thailand hinders the Thai government to move on with the project for the highspeed-rail-link between Bangkok and Vientiane. On March 12 Thailands Constitution Court ruled, that the government's legislative bill to empower the Finance Ministry to seek two trillion baht in loans for infrastructure development projects is unconstitutional, as Bangkok Post reports. This means delay for high-speed train lines to Chiang Mai, Rayong, Nong Khai (border to Vientiane in Laos) and Padang Besar, on the Malaysian border. See a presentation of the railway project from Boten to Vientiane on youtube.com. The planned railway will have a standard-gauge track, and a maximum speed of 160km/h, less than the 200km/h initially planned, as The Nation reported. See also this video showing the planned railwa line. The line will require 76 tunnels and 154 bridges, including two across the Mekong River, and 31 stations. These stations have been named until now: Boten, Ban Na Thong, Ban Hua Nam, Muang Xai, Ban Na Khok Tay, Huoi Phou Lai, Luang Prabang, Muong Xieng Ngeun, Ban Sen, Kasi, Ban Bua Pheouk, Ban Pha Tang, Vang Vieng, Ban Vang Mon, Ban Mang Khi, Ban Hin Heup, Phonh Hong, Ban Sakha, Ban Phonh Sung, Vientiane Neua and Vientiane Tay. Villages will have to be relocated, if the railway is constructed, as South China Moring Post writes. The railway project ist expected to draw an estimated 20000 Chinese construction workers into Laos. In the northern province of Oudomxay Chinese residents already make up around 15 per cent of the population of 30,000. "Chinese-owned hotels, shops and restaurants line the roads and street signs are in both Laotian and Mandarin", reports todayonline.com. 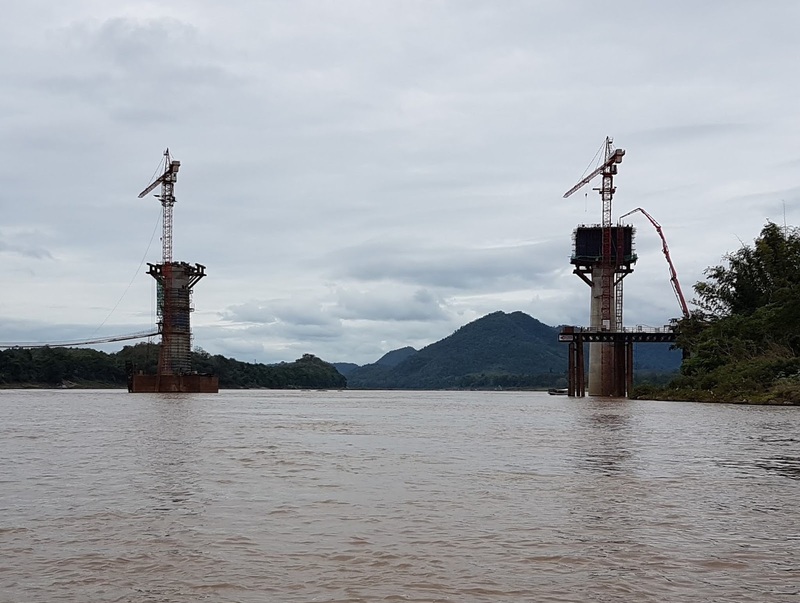 Chinese companies are already investing across Laos in everything from rubber and banana plantations to construction, hydroelectric and mining projects. The railway project increases fears. "I think if the Chinese are willing to provide the money, then they're doing it for a number of reasons," says Tristan Knowles, a director at Economists at Large, a Melbourne, Australia-based think tank. "You can flood the market in Laos with Chinese goods, especially agricultural products. The meat and livestock industries in Laos may not be able to compete unless they modernise in the time it takes to build the railway." Chinese companies own an increasing number of the rubber plantations that are the mainstay of northwest Laos’ economy, reports South China Morning Post. And even in Vientiane there are more and more shops run by Chinese people. Read more in the book Vientiane: Transformations of a Lao Landscape by Marc Askew,Colin Long adn William Logan. A Chinese-invested cement factory was inaugurated in December 2015 in Khammouane Province, expected to serve the construction of China-Laos railway project. The Jixiang cement factory, with an investment of 120 million U.S. dollars, is a BOT (Build, Operate and Transfer) project signed between China's Yunnan Provincial Energy Investment Group and Lao Ministry of Planning and Investment in March 2012. A representative of China's Yunnan Provincial Energy Investment Group told Xinhua that the designed capacity of the factory is 1 million ton a year, accounting for 20 percent of Laos' total cement production capacity. China has announced that it will invest US$31.4 billion in the Mengla economic zone in Yunnan province, which shares a border with Luang Namtha and Phongsaly provinces in northern Laos. In September 2015 the governments of Laos and China signed a cooperation agreement to establish an economic cooperation zone in the Boten-Mohan border area, aiming to boost trade, investment and tourism in the region as inquirer.net writes. Construction started on a railway linking Yuxi to Mohan in August and preparations for Mengla airport are underway. On the Lao territory, Boten is currently designated as a specific economic zone. The zone is being developed by two Chinese companies – Yunnan Hai Cheng Industrial Group Stock Co., Ltd and Hong Kong Fuk Hing Travel Entertainment Group Ltd with a concession period of 99 years. The Chinese developers have announced that they will focus on four mega projects in the zone including a duty free center, bus station complex, warehousing and a resort that shall feature a large natural marsh, hotel, meeting hall and other relaxing places. Chinese influence is also very apparent in Muang Xay, the capital of Oudomxay Province. Hotel Sheng Chang was established in early 2014 with a big supermarket, a casino and a restaurant. Chinese shops and advertisements fully span both sides of the road in Muang Xay. "One can find small and middle-sized Chinese auto repair shops, grocery stores, hardware stores, computer shops, guest houses, and, of course, restaurants", notes eastasiaforum.org. ; Auke Koopmans and rideasia.net. China in Laos: Is There Cause For Worry?